This may be no consolation to Seahawks fans, but don't fret over the play call. Despite how it feels, Lynch was not automatic. Before the interception, my mind slipped back to 2003, in Indianapolis. The Colts were down 38-34 with 40 seconds left with first-and-goal on the Patriots' 2-yard line. And they have a six-foot, 215-pound, bruising, almost unstoppable, running back with flowing dreadlocks and approximately 1300 yards and 12 TDs on the season. The Patriots stopped the Colts and Edgerrin James on four straight rushes. First down: James for 1 yard. Second down: James for no gain. Third down: Manning to Moorehead, incomplete. 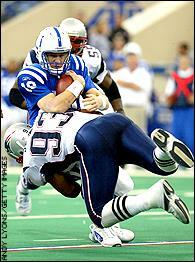 Fourth down: Willie McGinest takes down James behind the line of scrimmage to give the Patriots the win. Maybe the Colts would've won if they ran the ball on third down, too. Or maybe not. Nothing is certain until the end of the game. You can feel like Lynch would've scored, but you don't know it, and I've seen it before go the other way. Willie McGinest's last play highlighted two significant defensive stands by the Pats in the final quarter. This page contains a single entry by pudge published on February 2, 2015 7:44 AM. Dear atheists: if the Patriots had lost a Super Bowl due to a late circus catch again, that would'… was the previous entry in this site. Patriots: Do You Believe In Miracles? is the next entry in this site.